For families and couples looking for a peaceful holiday in the sunshine, the Village Inn Studios & Family Apartments is a perfect choice. Located on the outskirts of Laganas, the hotel offers relaxation and plenty of facilities. The hotel comes with a large outdoor pool and sun terrace as well as traditionally styled rooms. There are dining options available for guests to enjoy or they can take a stroll to the many restaurants and bars located nearby. There are plenty of attractions for guests to take advantage of including a water park, beaches and museums. The Village Inn Studios & Family Apartments provides the perfect getaway for all. Guests will be able to venture out of the hotel and away from this quiet area of the town should they want to go in search of a busier atmosphere. At just a short walk from the resort centre, guests will be able to wander around the shops and pick up some lunch at one of the many restaurants. There are family friendly bars dotted around the town and lots of atmosphere to embrace. For beach lovers, the beach is just a short drive away while the Zante Water Village is the ideal place for those who enjoy the thrill of a water park. 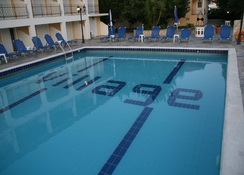 The hotel is located just 6km from Zante Airport. There is a total of 98 studios and apartments and all come traditionally designed with a bright and spacious interior. Guests can enjoy all the facilities they could need to make the most of their stay including en-suite bathroom, kitchenette, satellite TV, hairdryer, air conditioning and a safe. Rooms also come with a balcony or terrace, enabling guests to enjoy views of the surrounding area. The complex offers residents the chance to enjoy the freedom of self-catering, where they can make use of the fully equipped kitchenette. However, for those who like to dine out, the main restaurant offers a buffet style selection of dishes as well as themed evenings. There is also a pool bar serving a great choice of snacks and drinks throughout the day. Guests can enjoy the large outdoor pool and surrounding sun terrace where they can relax all day long if they choose. For kids who like to keep busy, there is a playground for them to enjoy as well as pool and table football. Guests who like to keep fit can make the most of the outdoor gym while those who enjoy some adrenaline filled activities should head to the water park of one of the many local beaches to sample some of the water sports on offer. Great complex for a relaxing holiday, it did have the issue of occasion smells but it wa Sibley ever brief! If you also want to be away from the strip this is the place to be.